In its second outing, the Hunter Safety Awards easily secured its position as the premier safety awards gala event in the Hunter region. There were around 50 organisations that were nominated as finalists in eleven categories and with around 500 guests in attendance it was most definitely a success. This was the second time that Take5apps had been nominated as a finalist in the prestigious awards and we were totally thrilled and extremely grateful to be a winner this year. 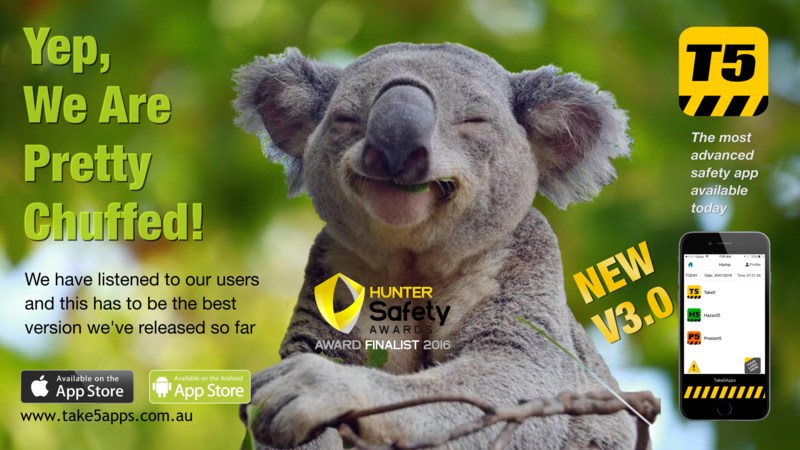 We are very proud of this achievement but we are more encouraged that this recognition has identified the T5 app as a legitimate safety tool. This will definitely make it easier to move our product forward. The safety of our users is always paramount as is the whole point of the app, which is to identify the risks and hazards, simplify the safety process, remove the long winded paperwork trail and make work safety simple, quick and to the point. Achieving this enables workers to get on with the job they were employed to do in the first place and do it safely. Stay safe - regards, Take5apps. Manage safety compliance on large projects or in large companies by administering the T5 Safety App with Apple’s VPP or Google for Work | Android’s EMM. Work safety compliance is set to change. The way we handle safety compliance for our projects will change dramatically as soon as businesses grasp hold of the advantages provided by Apple and Google’s app distribution for business programs. Using these programs to distribute the T5 Safety App can allow Principal Contractors to automatically control the compliance of their sub-contractors very easily. Apples Volume Purchase Program for Business (VPP) and the Google for Work | Android Enterprise Mobility Management (EMM) console can enable distribution of the T5 safety app straight onto your staff and your subcontractors smart phones and potentially implement site wide, multiple contractor safety compliance at a whole new level. Most smartphone and tablet users know there is a wealth of business applications available to them on iTunes or Google Play Android but when it comes to businesses understanding how they can effectively manage and distribute these applications, especially company or project wide, everything gets a little foggy. The primary fear is, if someone leaves so does the app and then we have to purchase the app all over again. This isn’t necessarily the case and hasn’t been for a while now. Apple and Google’s app distribution programs allow businesses to retain their apps regardless of whether or not a person leaves or moves onto another project. The apps are easily retrieved and moved across to other PD’s all at the discretion of your IT department. Apple and Google have rather cleverly set up these programs realising businesses desire to control the management and distribution of their apps. Astute organisations will see the advantages but as with all new technologies and programs the old adage will definitely be raised by those of the old school “if it ain’t broke don’t fix it”. The truth is, it is broke, we can fix it and we should fix it. It is always easier and more cost effective to prevent tragedies than to repair them. Finally, dwell on this… If you can control the distribution of a safety app that provides you with date and time stamped, fully compliant Take5’s, Hazard Reports and Vehicle and Equipment Prestart Checks from everyone onsite who has a smart phone; and If you can tell daily who has put their reports in and who hasn’t; if you can totally eliminate the paperwork; and if it only costs $5 per person and will probably reduce your onsite safety costs across the board… should you do it? Hoping you are always safe - regards, Take5apps. V3.0 is by far the best version of the T5 to date improving onsite safety reporting through simplicity and automation. So what's new with the T5?... Well, for starters we've added a Vehicle and Equipment Prestart Checklist to the app. This is the first addition to the T5's combined suite of apps. It now sports 3 apps, a Take5 Risk Analysis, a Hazard Report and a Prestart Checklist, and all for only $5. That's about the price of a cappuccino. It's a one off cost with no on-costs. You may be thinking, "what about internet data costs or additional charges per report?"... your business probably already has the internet and we're only talking email so your on-costs will be minimal and there are no additional report fee's. In fact, the app saves so much in time and efficiencies your overall costs will be significantly reduced. I promise, your accountant will love you. The T5 has been named as a finalist in the 2016 Hunter Safety Awards, the winners to be announced around mid-March. We are hopeful, but there are a lot of prominent companies renown for their safe work practices and innovation so we will just have to wait and see. Fingers crossed. V3.0 now allows you to add your company logo to the apps homepage but if you don't want to do that you can always add a photo of yourself to give it that small personal touch, or not, totally up to you. We have simplified the layout, added a couple of new features to reduce steps and add to the unseen automation of the app. We truly believe that this is the best version of the app so far and for the price we don't believe you can find a more affordable safety application that does so much, for so little and benefits so many. The most significant benefits, however, will be improved safety compliance, instant hazard and risk reporting and data capture. Safety professionals with a good knowledge of Excel or Access will be able to import the automatically attached CSV files and will be able to grind out some new found safety statistics from the data provided. The T5 can greatly benefit your QMS by providing time accurate data for analysis and aid in your company's continual improvement. Also you'll know straight away who is doing their safety checks and who isn't by simply checking your emails. There are many pluses with the new T5 and we do hope you check it out for yourself. For the price, there is nothing on the market that benefits proactive safety as much. It may be difficult to forego the cappuccino to buy the app, but if it reduces the possibility of having risks and hazards going undetected, it's really no loss at all. You can always buy a cappuccino tomorrow. Are You Still Using a Paper-based Take5 System? Take5 paper-based safety systems are missing the basic technological advantages that are found in a safety app. It's time to catch up and not get left behind... So what are you missing out on? Paper-based Take5 card systems are not instantaneous - If you still have people collecting Take5 cards from your workers on site, you're wasting time. Some organisations don't even collect their Take5 cards till the end of the week. These companies can not be certain Take5's are being done when they say they're being done. If there are no witnesses the cards can be filled in after the fact - Automatic date and time stamping eliminates the ability to complete Take5's prior to or after a task has been undertaken. Sure you can still do a T5 after the task but the auto date and time stamp will show when it was done. With the Take5 app, you can be on the other side of the country and receive your workers Take5 within seconds of its completion and know exactly when it was done and who did it. Manual data collection, collation, and entry, is a time-consuming process (if it's actually done) - The T5 app reports come with an attached, automatically produced, CSV file that can be imported directly into a spreadsheet or database allowing improved statistical analysis of your safety data.A paper-based hazard report can also be extremely time-consuming - especially if you have to get a form from the office, fill it in and return it to your supervisor. With the H5 app, a report complete with photos can be completed and on the Safety Managers desk in minutes and without having to leave the Jobsite. Printing costs totally eliminated - when you purchase the T5 safety app you do it once per device. There are no ongoing costs, you get all updates for free, the app stays on your device forever or until you delete it. All you need to change is the site information (if you move on) and the email addresses of your report recipients (if they change). There are many advantages to personal device safety reporting, but the most significant has to be time. It takes less time to complete a Take5 or Hazard report and it takes less time to get it to your supervisor or safety managers desk. Stop hanging on to the old systems, its time to move on. If you've worked on a lot of construction or mine sites, you have probably been exposed to many different types of safety processes in the on-going war of incident prevention. And if I was to guess, I'd say that many of the safety documents you've used have been overly complex in their effort not to miss any vital detail be it ever so small. If we're being totally honest, unless you prepared the document yourself, you probably never read right through to the end before signing on the dotted line confirming that you actually read what you probably didn't. Sure there are some who read them in their entirety but honestly they would be the minority and not the majority. Most of us with a background in safety are familiar with the different types of safety documents like, JSA's, JSEA's, SWMS, TAKE5's, SAFETY OB's, etc, which all come in a variety of shapes and sizes and all with the same intent, keeping workers safe. We understand the legal requirement for us to map out our job steps using a predefined risk matrix for risk identification and reduction and as safety becomes more commonplace, those responsible become more proactive implementing additional prevention methods all in the battle to eliminate accidents in the workplace. The biggest issue we face however is not the documentation, it's the workers and their complacency. The problem is, that in our current technological age many companies are still content to manage their risks manually using forms and cards that require acknowledgement, completion, signatures, collection and collation. In a majority of these cases, the data collected doesn't go anywhere and if it was to be analysed you would have to be sceptical of the data's authenticity due to the inconsistencies present in a manual system. I suppose we should be thankful we are doing anything at all but honestly how effective are our current Take 5, Hazard Identification and Safety Observation systems. 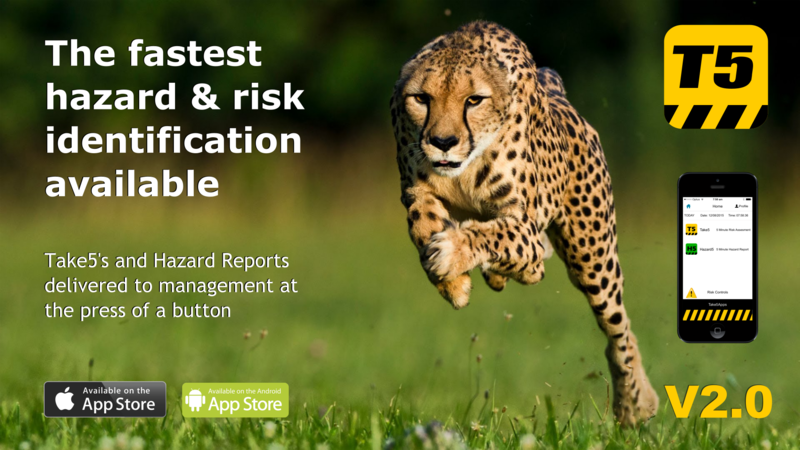 It is my belief that app technology is the future in hazard and risk management and I'm pleased to say that the future is available right now. 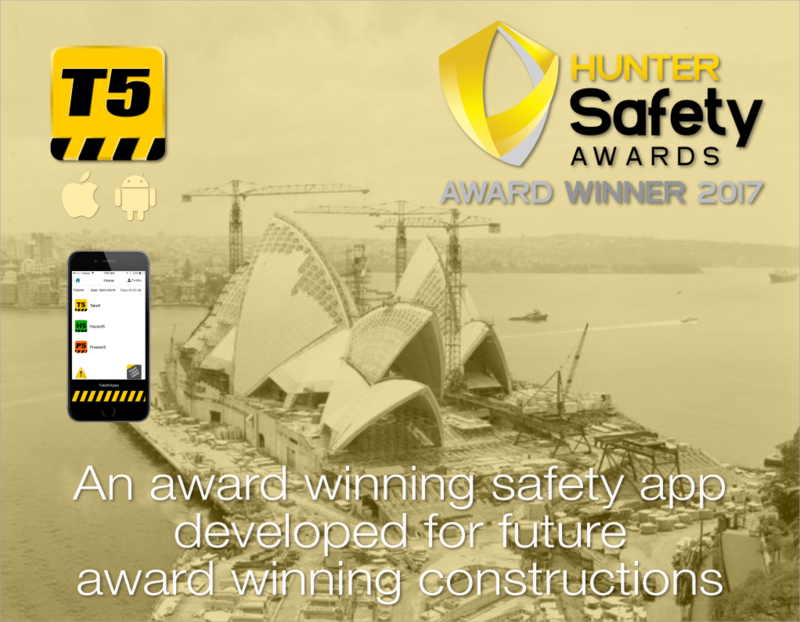 There are a number of safety apps out there today but if you are looking for something that is close to being industry compliant and in line with many of the current Take 5 card systems, then you should take a look at the T5 Safety App. How would I know this? Well, I've been in safety for over 10 years and I'm familiar with many of the safety systems used today and I'm also one of the creators of the T5 safety app. I've researched some of the safety apps available and by experience I'm kind of familiar with how it all works and with how it should work. We released V1.o of the T5 safety app in May 2014 and last month on 22 October 2015 we released V2.0. It is available for both iOS and Android personal devices. It has a simple, familiar layout and designed to be easy to use. It is concise with radio button selection to maximise data entry speed. It automates many of the processes required to report hazards and risks. It is much faster than traditional methods, is more accurate, it automatically attaches CSV files to its reports so the data can be easily imported into analysis software, it has date and time stamping making it compliant and in line with quality systems requiring accurate data for continual improvement and most importantly if you have wi-fi access, reports can be submitted and on your managers desk in as long as it takes for an email to transmit. A little longer if you've taken photo's of onsite hazards, but we're only talking seconds. Have you ever noticed that many incidents had hazards that were never identified until it was too late. In many of these cases it's not because the hazards weren't seen, but that they were not communicated in time to those who could have done something about it. It's crazy how bad accidents are always the subject of gossip and everyone knows about them in seconds and the experts come out of the woodwork bleating what should have been done to prevent them. We all make judgements against those responsible saying things like "idiots, what were they thinking" when it was obvious they weren't. And all too often the incident goes viral much to the disappointment of the ill-struck company. Good Safety Managers are what I regard as the quiet achievers. They work tirelessly to identify issues and effectively head them off well before they suffer from infamy. When they do hit the spotlight it is always because something went wrong. Their unwanted fame does not fill them with pride and their popularity is usually only with senior management demanding they clean up the mess as soon as possible before it hits the airwaves. These types of incidents always come with what I like to call pariah marketing and they always receive the best coverage. 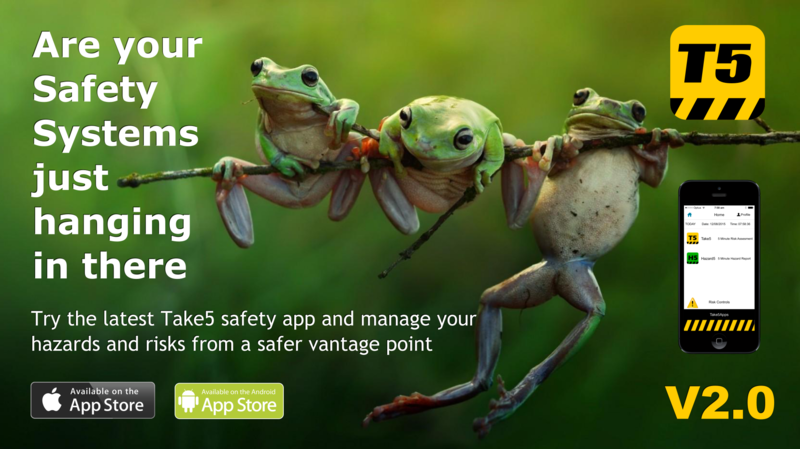 The Take5 safety app is designed to identify hazards and risks and communicate them to safety management in the fastest possible time frames. It is a great weapon against pariah marketing. You can literally fill out the Take5 in less than 5 minutes and if you have wi-fi it can be emailed to management onsite or offsite quite literally in seconds. The Hazard Report, if it has photos, takes a little longer but is also easily completed within minutes. These reports can be emailed to multiple recipients so you can be sure that those who need to see them will see them in record time and they are date and time stamped so reports can't be fudged and compliance is perfectly met. The benefits associated with the T5 app transcend the speed in which an emailed report can be transmitted. The reports also come with attached CSV files that can be directly imported into spreadsheets and databases. It eliminates the need for the collection and filing of traditional Take 5 cards and the time required to manually enter the data from each card. The T5 users profile allows for personal information and email addresses to be automatically integrated into the reports eliminating the need to enter these every time you do a report. If heading off incidents is important to you, you should check out the T5 for fast hazard and risk management. Early last year Gideon Ashby and I released the first version of our Take5 Safety App. We felt the app was a timely addition to the variety of tools available for managing hazards and risks but we were seeking to utilise the technology that was available in smarter, more practical way. 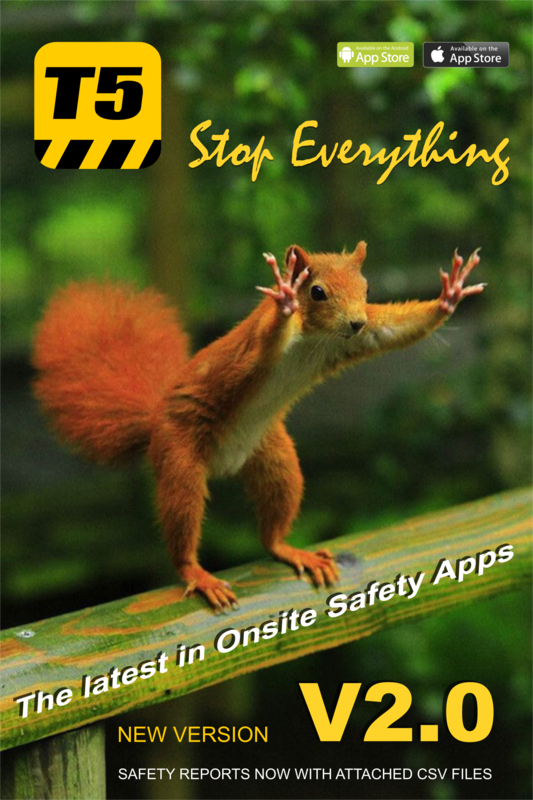 What we did was create an app to replace the Take5 booklets that are used on many sites and enable instant submission of each Take5 report directly to safety management and their administration departments. We also added the ability to create hazard reports with a simple description, severity grading, geolocation and photos with a view to capturing onsite hazards and instantly submitting them to management, reducing potential incidents. Due to some mine sites banning the use of smartphones and viewing them as a potential hazard, it didn't catch on the way we expected it to. We believe the prevention of hazards and risks is a far better use for personal devices and they should be viewed as an asset for prevention rather than a perceived risk which could easily be managed through policy. Regardless we are starting to notice a change as technology becomes more relevant in the workplace and more and more organisations are beginning to use the T5 app. Along the way, we have listened to our users and have tried to create a generic tool that is beneficial to the wider safety audience and we are starting to see a shift in momentum as organisations start to realise the benefits of instant notification. Version 2.0 now includes attached CSV files for easy import of data into spreadsheets or databases. At the request of our users, we have enabled the ability to resend email reports from the historical records of both the Take5 and Hazard forms. Version 2.0 is looking sharp and remains very easy to use and we believe it will save your organisation time and money. It is a far more efficient way to eliminate potential hazards and risks and amazingly it simplifies and speeds up the whole process. Please have a look at our T5 app suite, we are confident it can assist you in the management and reduction of hazards and risks.